NHS England » I thought care campaign would fizzle out after two Tweets! Dr Kate Granger has revealed how she thought her #hellomynameis campaign would amount to “one or two tweets”. Her compassionate care crusade has since turned into a global phenomenon and is followed by 38,000 people around the world, with #hellomynameis receiving more than 800 million Twitter impressions. The hellomynameis.org.uk website gets around 100 hits per day. Virgin empire mogul Richard Branson is just the latest in a host of stars, celebrities and influential people to support her. The campaign has since led directly to the Kate Granger Compassionate Care Awards which will be presented by Kate for the second successive year at Expo 2015 being staged at Manchester Central next week. And Expo has just given the campaign yet another boost with #hellomynameis featuring prominently on every delegate badge. It means that more than 5,000 people attending each of the two days of the event will be sporting the campaign brand. Kate, 33, who has terminal cancer, explained how the campaign was launched at the end of August 2013 as a direct result of her moaning to her husband, Chris Pointon, about the lack of compassion being shown by staff during her care. He told her to stop whinging and to do something positive about it. In that instant the #hellomynameis campaign was born. “I was being treated for an infection,” she explained. “That experience was difficult as there had been a fair few problems with my care. But the thing that I noticed most was that people weren’t introducing themselves to me before they did things to me. “I was just expected to put my arm out to have my blood pressure taken by this anonymous person I’d barely had any communication with. Then someone would come along and give me antibiotics and not speak to me. Even the consultant on the ward round assumed I knew who he was. He should have at least introduced himself. “I’ve always been a keen observer of my healthcare,” added Kate, who is in her tenth year as a doctor and is Acting Consultant for Medicine for Older People at Pinderfields Hospital in Wakefield. “I’ve written about it, reflected on it and really thought about what constitutes good care and how I can make the care I deliver as a doctor better by using my own experiences of being a patient. “This lack of introductions from people who were treating me seemed so basically wrong and I wondered how we could have lost that from health care? How can we have got to a point where we don’t see patients in beds as people anymore? So much so that we don’t even give them the common courtesies that we would if we met someone in the street? “Being passionate about health care, communication and how we deliver care, I discussed this with Chris during visiting time. He told me to stop whinging and do something about it. As the campaign gathered momentum in came to the attention of a number of leading politicians, stars and celebrities who threw their weight behind it. Prime Minister David Cameron and Health Secretary Jeremy Hunt top the list of politicians that have signed up. Celebrities include Bob Geldof, Kylie Minogue, the cast of TV soap Coronation Street, Hollywood star Drew Barrymore and even the demon cooking duo the Hairy Bikers. But the name that stands out above all others for Kate and Chris is that of chef Michel Roux junior, not least of all for his continued support and kindness, the cards of support he has sent when Kate has been at a low ebb, but also because he gave her a personal lesson in how to make brioche. She hopes the campaign will keep going long after she has gone, saying: “#hellomynameis isn’t just about introducing yourself to your patients, it’s about see the person behind the condition, treating them as a person with their own priorities, fears and anxieties. And really understanding them and treating them as you would if they were a member of your own family. Video interview with Kate and her husband Chris Pointon talking about the #hellomynameis campaign. I am about to start the second year of a nursing degree and I’m proud to say that Kate Granger’s work on improving the interpersonal element of patient care has played a huge part in my journey so far. 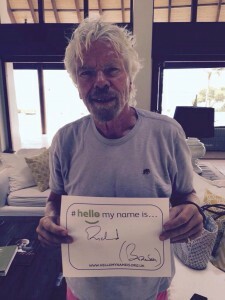 Also I have been involved in supporting family members who have been in hospital and have seen #hellomynameis in action – what a difference. Thank you to everyone but particularly to Kate and Chris.